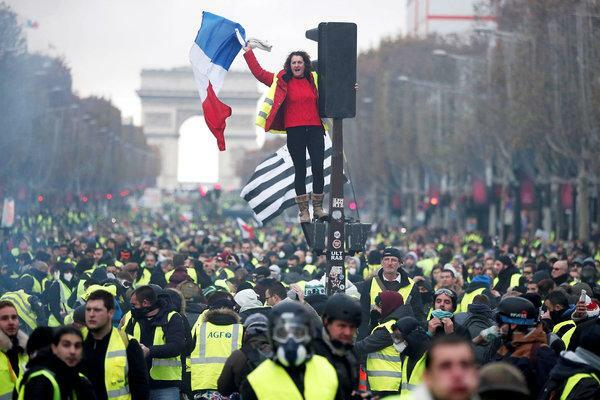 The recent Yellow Jacket demonstrations all across France in the last month is just the most recent revolt against growing global wealth inequality. Of course, the French have always been prone to revolution and revolt. The French Revolution and the storming of the Bastille in 1789, the revolt in 1832 which is the basis for Les Miserable and continuing up to Danny the Red and the taking of the Sorbonne in 1968. In the OECD [Organization for Economic Co-operation] countries, the richest countries in the world, the growing wealth inequality is very problematic. In the less developed countries the growth of per capita GDP is way up. Not so with the developed countries. In OECD countries the top %.6 of the populations – or 42 million richest people -held 40% of world wealth. The bottom 95% held 28% of world wealth. So, the inequality is at one of the highest levels it has ever been. Through out history, whenever wealth inequality becomes so unbalanced, there is either revolution or populist rebellions. That is what we need to keep in mind. The top 1% and all the institutions that support them need to be reminded that, if this inequality continues and, worse, increases there will be civil and social unrest. Unfortunately, at least at a distance, much of the top 1% in the world today seem unable to see what the consequences might be if this continues. There will be more Yellow Jacket revolts in France and in other OECD countries. There will be major events such as Occupy Wall Street which redefines perception. As I wrote here, the most significant meme in recent history came out of the Occupy movement: “we are the 99%”. Why significant? Prior to Occupy, wealth was mostly discussed in quintiles. The rich were in the top quintile and the poor were in the bottom two. Since Occupy, we now talk about “the one percent” and the 99% when speaking about wealth inequality. Occupy redefined the way that wealth is reported and that changed the game. So, the two big winners in 2016 were the democratic socialist and the fake populist. Clinton, and most of the Republican candidates were of the 1% and therefore were off in their messaging. One month before the 2016 election I forecast that from 2017-2020 there would be massive demonstrations in the streets of the U.S. Granted most of them are issue oriented such as the Women’s March, the Never Again gun control demonstrations, and Black Lives Matter. So, there were no demonstrations specifically about wealth inequality, but Americans are increasingly willing to take to the streets. The current government shut down, now in its fourth week, has shown just how close to the edge financially many American households actually are. What a contrast between federal workers having to sell things for food money and the rich President and Senators who seem tone deaf to the economic crisis their ineptitude has caused. Compassion is ‘trumped’ by self -interest and political ends. In many countries, and certainly the U.S. there is a big disconnect between those with extreme wealth and the bottom 40% of the population. The plutocrats seem to have no sense of history, all they see is their entitled self-interest. Since there are no real attempts by the plutocrats to truly work toward a world of less wealth inequality, they will be responsible for any uprisings, demonstrations and actual rebellions that occur. As I forecast in my October 2016 column that there would be massive demonstrations in the streets of American from 2017-2020, I now predict growing numbers of demonstrations against wealth inequality in many countries around the world from 2019-2022. By their inactions the plutocrats are echoing Marie Antoinette, who, when told that the peasants had no bread to eat said: “Let them eat cake” It didn’t turn out so well for her.